Each goal stems from a Biblical mandate with a contemporary flair rooted in technology’s leverage and scale. We’re pursuing BHAGs #1 and #2 through Ceaseless and spf.io, but haven’t done as much for #3. 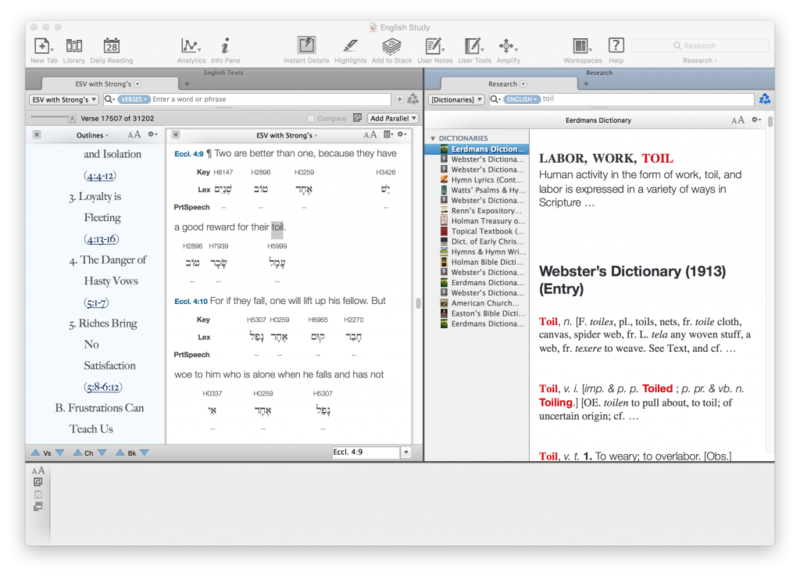 So when my friend David Sanford at Accordance Bible Software gave me a free review copy of their English Learner Collection, I was delighted to give it a try and see what’s already happening in this space. I got hooked on the Bible as a pre-teen, putting the book on my nightstand to remind me to read a passage before going to bed. In middle school I got a Dell Axim PDA and discovered the useful Pocket e-Sword app. This got me reading on the bus. My favorite feature was seeing different translations like the ESV and The Message in parallel. During my college days I devoured podcasts from Ravi Zacharias, John Piper, RC Sproul and Chuck Swindoll, listening to their teaching during the long commutes. And as a student leader in Cru at the University of Washington, I often referred to Blue Letter Bible and BibleGateway to prepare Bible studies. Then came the Bible app. By this time I had switched to an Android phone which didn’t have Pocket e-Sword, so I tried the Bible app and stuck to it for two reasons: 1) my notes were synced to the cloud, 2) the daily reading plans were built-in. To this day, I miss viewing translations in parallel and having quick access to commentary resources. I don’t care much for the activity feed/social features. Which leads to this review of my first real experience with professional Bible software. I have a confession to make: It’s been a long time since I’ve done an in-depth Bible study of a text. Though I read for personal and devotional reasons nearly every day, I rarely need to prepare a Bible study, sermon or paper. Most of my recent talks have been focused on the intersection of God’s Kingdom and technology and hence, I’ve leaned away from word studies to working with passages and themes. 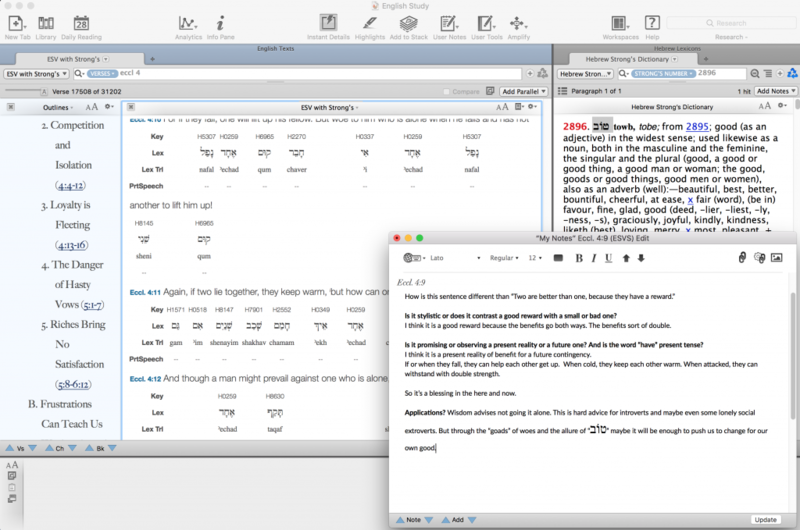 So without further ado, here’s my experience using Accordance as a complete novice. I received a link to download the English Learner Collection, entered my key and was greeted with this installer. 705MB of resources! Not too shabby, but I had to wait awhile before I could start using it. Installation was simple, but it took awhile to download all the resources. I looked up Ecclesiastes 4 and researched the word “toil”. The Research panel opened on the right showing me the definition. So many words are hyperlinked, which makes it convenient to look up related materials, but I also found my curiosity taking over and leading me down Wikipedia-like rabbit trails. I suppose getting lost in the Bible isn’t a bad thing :). Looking up the word “toil”. Diving into “toil” in the original language. 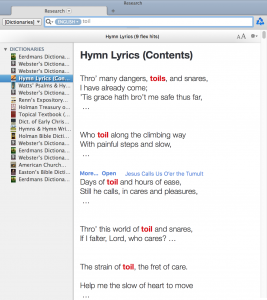 Worship leaders could find this hymn lyrics search useful. I wish I could hear the original language words spoken in Hebrew/Greek by tapping on it. I wish I could have this on my mobile phone since that’s where I do most of my Bible study nowadays. I decided to dive deep into the word “reward”. First stop, the Hebrew lexicon. First discovery: the name Issachar means “there is reward”. While taking a screenshot on my mac, I discovered that holding the command key while hovering over a word conveniently shows details in the instant detail view. I clicked on the scripture reference and the instant detail view gave the context for the use of “Issachar”. 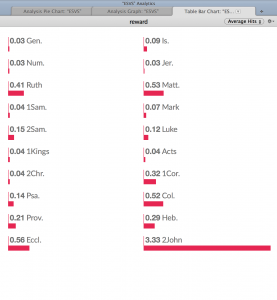 Average hits for the word “reward” in each book of the Bible. 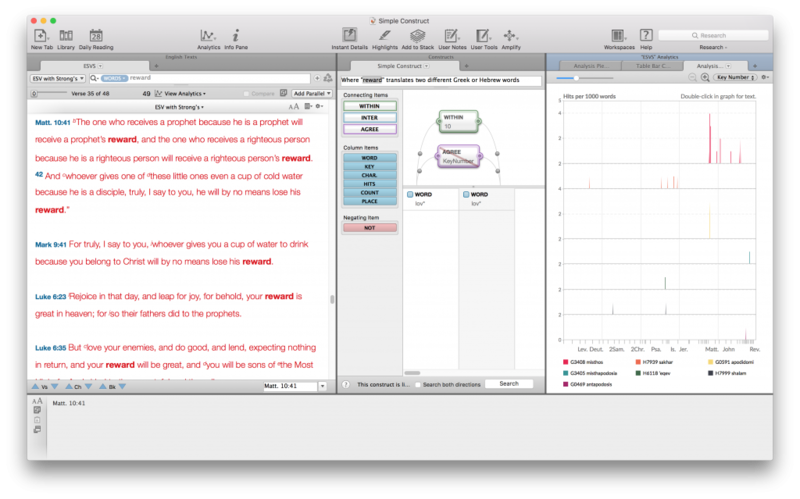 Next I tried the “Simple Construct” workspace and stumbled on an analysis view that gave several visualizations to see where words appear in Scripture. I was surprised to find that “reward” occurs relatively frequently in 2 John, but it turned out to be an anomaly because the book is so short. A sophisticated analysis tool, which I need more training to understand how to use. Next I looked up 1 John 5:6 to see if comparing different translations would shed light on the tricky passage. Unfortunately, my English Learner Collection didn’t come with the translations I wanted to compare, so this view may not be useful unless you buy additional translations. Also, the comparison view begins as a diff (showing you what words were added/removed between each translation), which makes it hard to read. 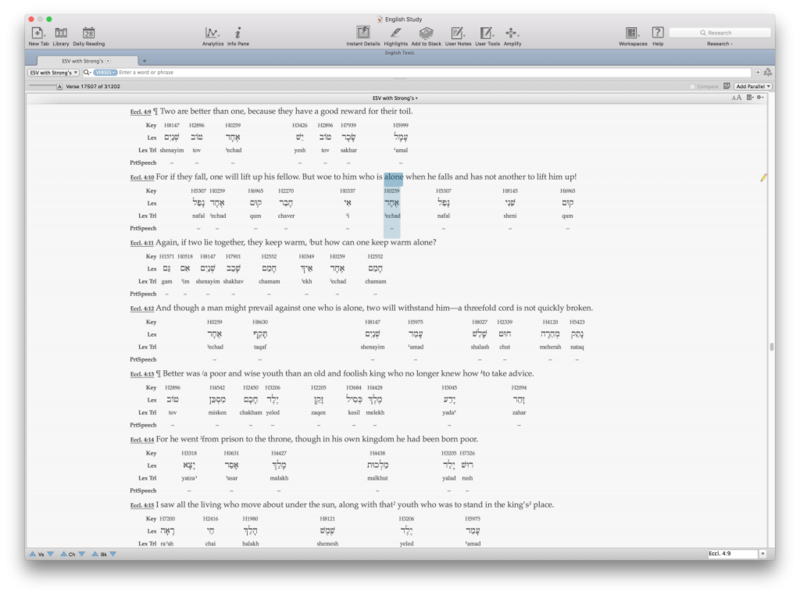 The parallel view was difficult to read by default because it shows the differences between each translation. Unchecking “Compare” makes it more readable. Speaking of readability, it turns out that the app has a nifty reading mode (shortcut ^R) which makes the text fill the screen. You can also pop out the instant details widget and put it close to the words you are looking up. The last thing I tried was creating a note based on my study of the text. This step is where I realized that although jumping from resource to resource satisfied my curiosity, I needed to pause and simply meditate on the text. The application puts a lot of information at your fingertips, but you still need to stop and think to make something of it. 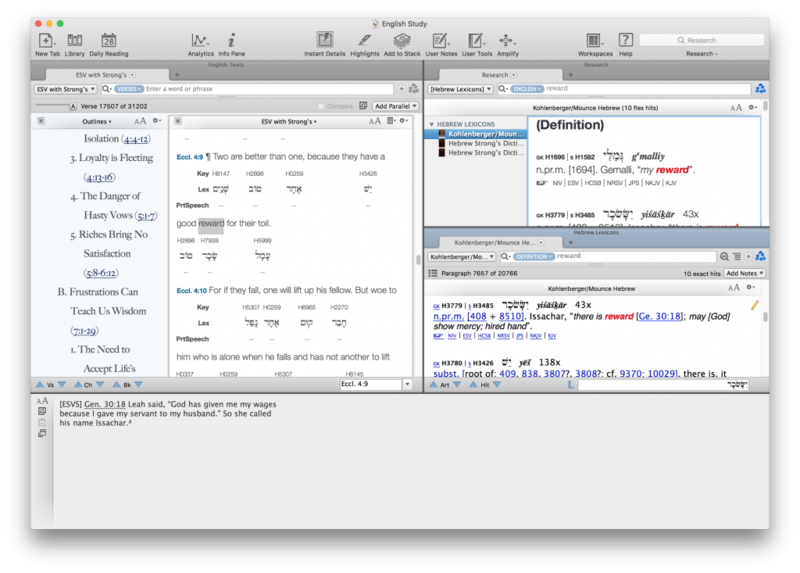 After using Accordance for an hour, I noticed that the tool was leading me to pay closer attention to words, to ask questions about syntax and grammar, to explore inter-textual relationships and to probe. 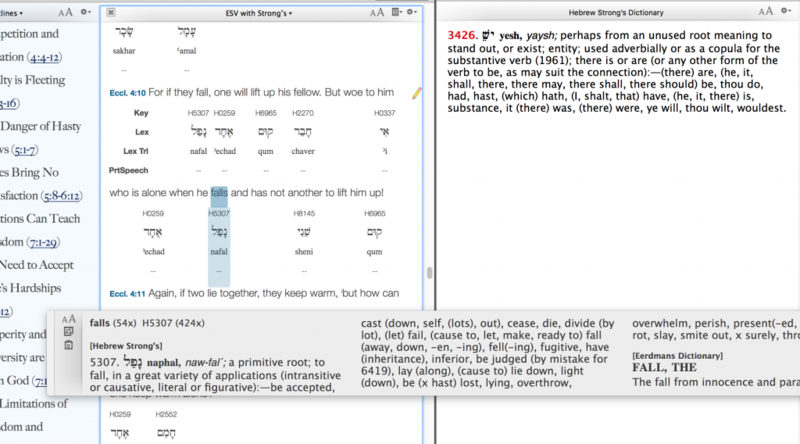 I found myself slowing down and trying to pronounce Hebrew words while reading verses in English. And I found the interface to be easy to explore with many features discoverable by simply clicking around. 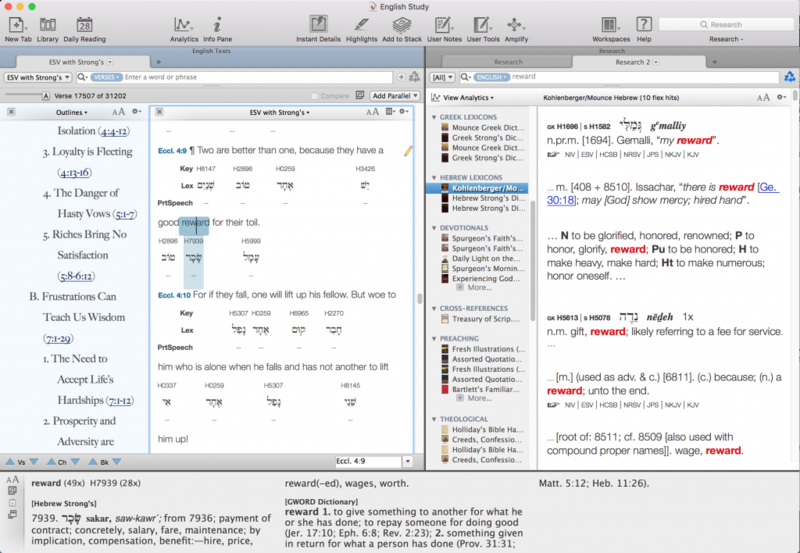 I think people seeking an intuitive way to explore the Bible in its original languages will find Accordance very accessible and useful. However, not being a biblical scholar or pastor by profession, I’m not sure how often I would turn to these tools and resources for personal devotions. Oftentimes the rich resources resulted in more questions than I had time to research. This curiosity-driven exegesis was enjoyable, but I didn’t reach the point where the app helped me interpret the text and synthesize its implications for my life or others. Perhaps I simply need to spend more time learning the relative value of the different resources and how to use them effectively. With regard to the goal of Worldwide Biblical Literacy, I think the biggest win would be having the Instant Detail View on my phone (Accordance has an iOS app, but I use Android) along with Strong’s numbers linked to foreign language translations. 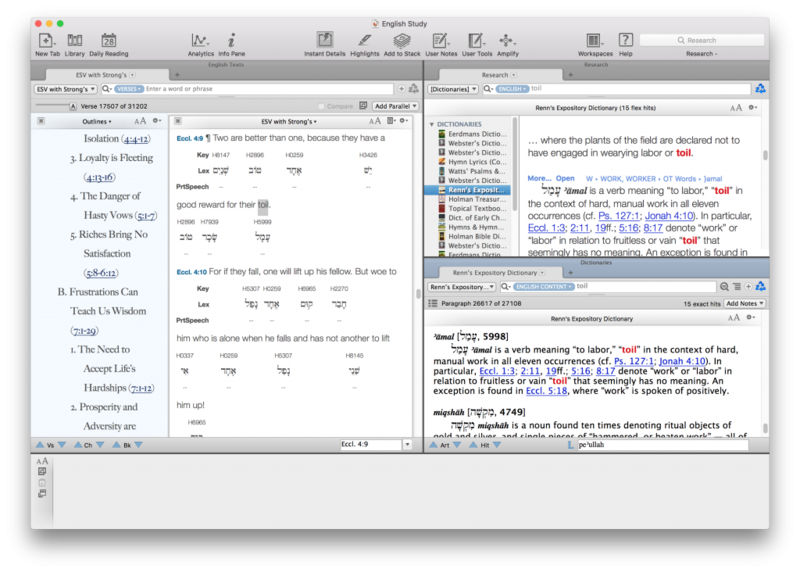 The ability to tap on a word and study the underlying Greek or Hebrew and see where else it is used can go a long way to understanding the Bible more precisely. Having it widely available for the majority world (in their language!) on mobile devices would be transformative (Note: it seems like Accordance hosted several seminars in Asia in 2011 2016, see links in comments). Of course, ultimately Biblical literacy means going beyond understanding Scripture accurately to believing and obeying it and for that we must rely on the Holy Spirit :). 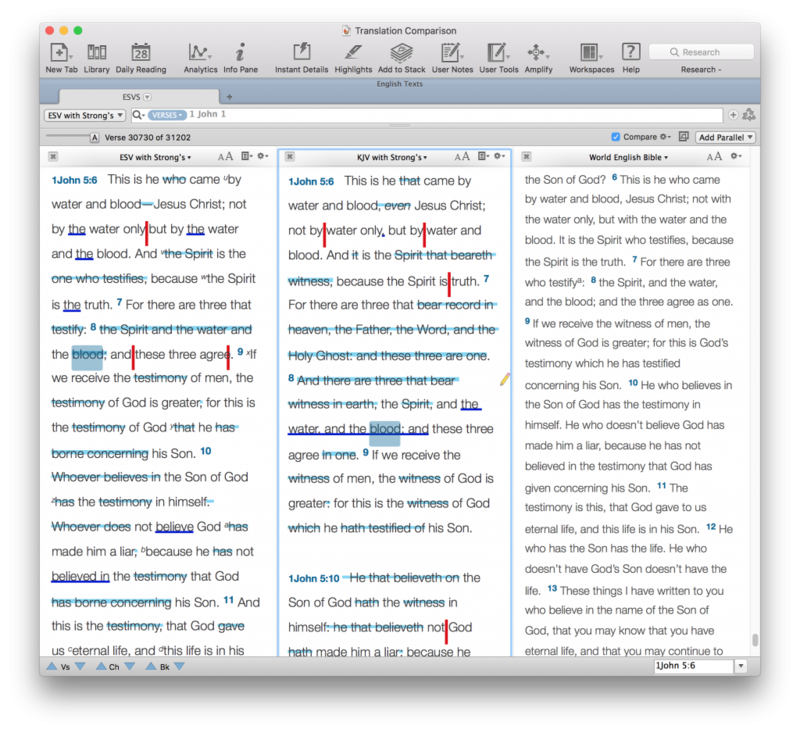 You can learn more about Accordance at accordance.bible and thanks to David for the review copy of the software. More than 700,000 people welcomed the Seattle Seahawks from their victory at the Super Bowl. I am proud to say I was one of them. While waiting for the parade to start I was reminded of two stories from the Bible: the story of Zaccheus (Luke 19:1-10) and the parable of the 10 virgins (Matthew 25:1-13). 1. Zaccheus the short fan. Zaccheus was a short, rich tax collector who wanted to see Jesus as he passed through the city of Jericho. The crowd completely blocks his vertically challenged view so he runs ahead and climbs a tree. The Seahawks parade was exactly like this. Some folks climbed honey buckets to get a better view. I resigned myself to holding up my smartphone and sneaking closer and closer to the street as the crowd got antsy. That aside, I realized that winning the SuperBowl was such an amazing collective experience that all 700,000 of us were willing to wait outside in 25 degree weather just to see and celebrate with our championship team. It helped me feel Zaccheus’ excitement over finally getting to see Jesus–he was so eager to scurry ahead and climb a tree just to get a glimpse. Read the rest of passage to see how that glimpse changed his life. Jesus tells an odd parable about being ready for his return. Ten young women were waiting for a wedding party to get started, which obviously cannot happen until the groom arrives. He takes so long that the women fall asleep. Then suddenly at midnight he shows up, everyone is stirred up, and they wake up. Five of them brought oil to refill their lamps so they can see, but the other five had to go buy fuel. Unfortunately they take too long, miss meeting the groom, and the feast starts without them. 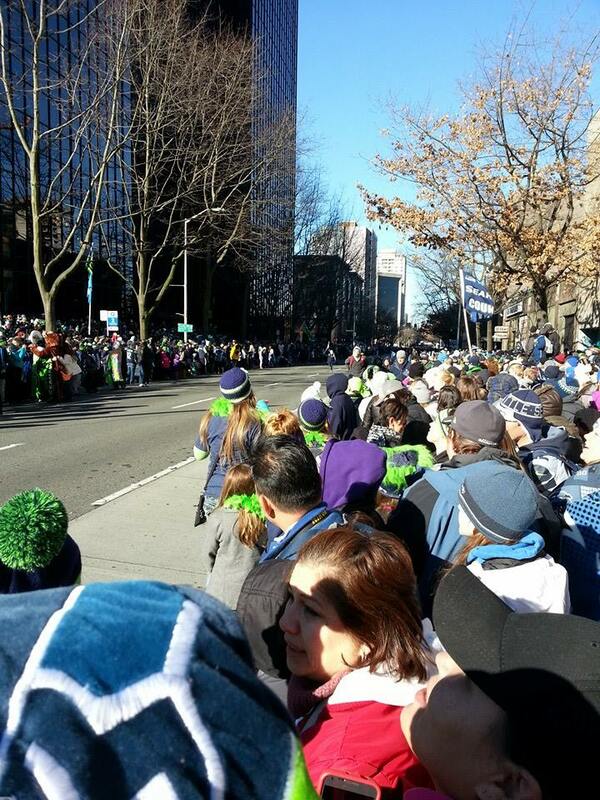 I similarly did not expect the Seahawks parade to be delayed for over an hour. No one in the crowd knew when they would finally show up and we all occupied ourselves with the occasional cheer, random picture taking and browsing the Internet on our smartphones. Someone would call a friend watching TV who would tell them, “The National Guard just put Pete Carroll into a hummer–he should be there in 10 minutes!” and we would all get ready, but 20 minutes later there would be no one would in sight. Soon my phone chirped the dreaded low battery beep and like the young women in the parable, I wasn’t prepared! By the time Marshawn Lynch, Pete Carroll, and Russell Wilson came around I had to carefully ration the pictures I took to ensure my phone would last until the next celebrity. In the end I was so anxious about my battery that I didn’t really get to enjoy the parade itself. In the case of the parable, the consequences were more severe–exclusion from the party altogether (I didn’t have tickets to CenturyLink anyway), but missing out on the fun of the parade after waiting over an hour in the cold because I was ill-prepared for the delay is a good way to prod me to be ready for the real event I’m looking forward to. 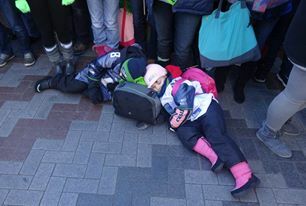 Thank God we have SuperBowl championship parades to help us relate to and understand the Bible :-). Posted on May 5, 2012 January 5, 2019 Tags bible, notes, theology, worldview1 Comment on Are Honor Killings Condoned in the Bible?